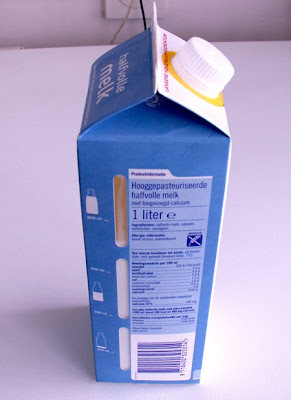 You might have seen this already the new Tetrapack for milk. The transparent windows to see how much milk there is. This is an idea what makes you say:"why didn't I thought of that". This is a great new design and it is not just for to see how much milk there is, people like to see what is in the packaging mostly to see if it is the the same or if it is not very old and gone bad. Click the full post button to read the rest of the post. So how did they make it possible to have those windows. They did it quite ingenious, they just put the plastic sheets between 2 layers of cardboard. It's that simple just between 2 layers outer and inner while the cardboard was made so it no special glue uses to past a sheet inside. I think its a quite important thing for new packaging designs. Try to make it possible to see how much their still is in a package. It is quite important to help your consumer with the packaging, you should not only make the package design pretty but also easier to use. 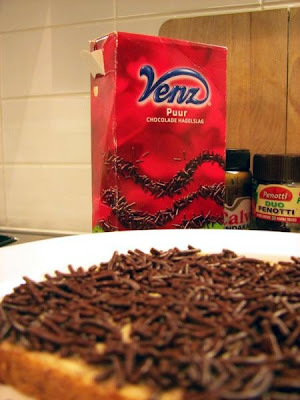 Talking about the sprinkles box of hagelslag box I think it could be possible to enlarge and to put cereals in it actually. And that you only have to open the shaft and poor the cereal out instead of opening the box and then open the bag inside it.